Stank'iya - (Coyote) - A plywood replica of a Chinook canoe. 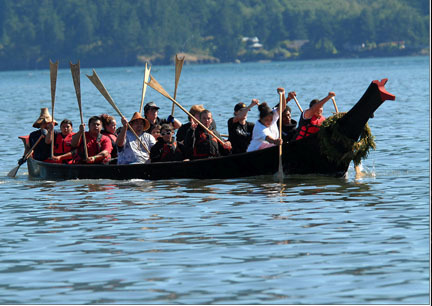 Stank'iya is a 33 ft plywood replica of a Chinook canoe made for the Confederated Tribes of Grand Ronde. His name means Coyote. Bobby Mercier, a member of the Grand Ronde Canoe Family, brought volunteer crews from Grand Ronde several times to help make this canoe, they also helped build an extension onto my shop to accommodate their giant canoe. This is a serious ocean-going canoe. Both Ul Iymist and Skakwal have proven themselves to be safe and effecient in some very bad conditions, but Stank'iya is fully capable of journeying offshore in the North Pacific. 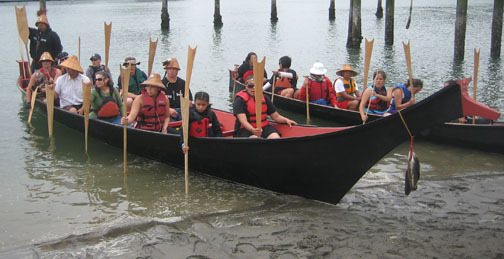 Stank'iya has traveled many times on the annual Paddle Journeys as well as cruising extensively around the Pacific Northwest. 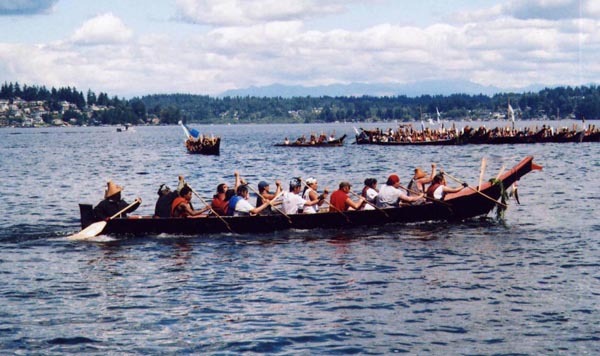 He has been paddled on the Willamette and Columbia rivers, Puget Sound and out on the North Pacific Ocean as well as racing at the Coquille Indian Tribe's Salmon Days.